Union for the Liberation of Ukraine (SVU) (Spilka vyzvolennia Ukrainy, or SVU). A fictitious political organization invented by the GPU for the purpose of staging a show trial to intimidate the Ukrainian intelligentsia and put an end to Ukrainization. 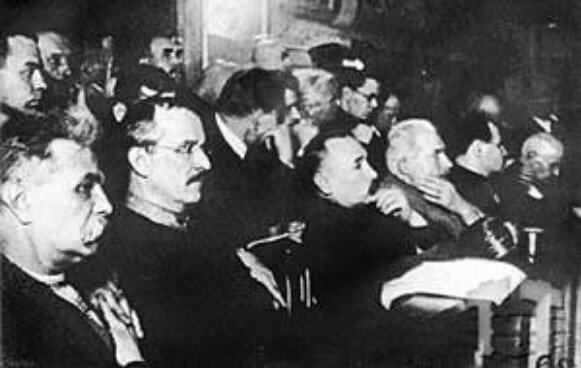 The trial of 45 non-Communist Ukrainian intellectuals was held in the Kharkiv Opera House from 9 March to 19 April 1930. Most of the defendants were associated with the VUAN: 2 of them (Serhii Yefremov and Mykhailo Slabchenko) were academicians, and 21 (Yosyf Hermaize, Oleksander Cherniakhivsky, Vsevolod Hantsov, Hryhorii Ivanytsia, Vasyl Doha, Kostiantyn Shylo, Hryhorii Holoskevych, Hryhorii Kholodny, M. Kryvyniuk, Volodymyr Strashkevych, Vadym Sharko, Volodymyr Durdukivsky, Viktor Dubrovsky, Kost Turkalo, Arkadii Barbar, Volodymyr Udovenko, Volodymyr Pidhaietsky, Mykola Kudrytsky, Valentyn Otamanovsky, Taras Slabchenko, and Andrii Nikovsky) were research associates. Many lectured at various institutes. The second-largest group consisted of educators of secondary schools and higher schools: Yu. Trezvynsky, Oleksander Hrebenetsky, N. Tokarevska, A. Zalesky, Petro Yefremov, L. Bidnova, Volodymyr Shchepotiev, M. Lahuta, Y. Karpovych, and K. Panchenko-Chalenko. Three defendants (Mykola Pavlushkov, Borys Matushevsky, and M. Bily) were university students who were accused of organizing a youth branch of the SVU, the Association of Ukrainian Youth (SUM). Five were active in the co-operative movement: Sharko, Avksentii Bolozovych, M. Botvynovsky, Petro Blyzniuk, and Z. Morgulis. The brothers Volodymyr Chekhivsky and Mykola Chekhivsky were prominent leaders of the Ukrainian Autocephalous Orthodox church (UAOC). Two defendants were writers (Liudmyla Starytska-Cherniakhivska and Mykhailo Ivchenko), and one was a lawyer (Kostiantyn Tovkach). Some of the accused had been active supporters of the Ukrainian National Republic and had occupied high government posts in the revolutionary period. Besides the 45 accused who were put on trial, thousands of Ukrainians were arrested for ‘belonging’ to the SVU or SUM. According to the prosecution the conspirators began to organize the SVU in 1926 on orders from the émigré Levko Chykalenko. Their purpose was to overthrow the Soviet regime and restore capitalism in Ukraine in 1930 or 1931 through an armed uprising of the kulaks and other capitalist elements. The rebellion was to be accompanied by an offensive by Poland and other capitalist powers. The SVU, it was alleged, had first hoped to restore the Ukrainian National Republic and then opted for a fascist dictatorship headed by SerhiiYefremov. The police claimed to have uncovered 15 five-member cells in the VUAN, the hierarchy of the Ukrainian Autocephalous Orthodox church, the management of the rural co-operatives, and the school system, and among former ‘bandits.’ All the defendants were convicted, but they were given relatively lenient sentences ranging from 3 to 10 years' imprisonment. Ten were given conditional sentences and released, and seven were exiled from Ukraine for three years. In the next few years almost all of the defendants were rearrested, and perished in prisons or concentration camps. Although the existence of the SVU and Association of Ukrainian Youth as depicted at the trial has been unquestioned by Soviet historians and some opponents of the Soviet regime, most objective researchers of the period have recognized that the two organizations were contrived by the authorities for a political purpose. The SVU trial was one of the first show trials in the USSR to be aimed against the ‘bourgeois nationalist intellectuals.’ The specific targets of the SVU trial were the VUAN, the Ukrainian Autocephalous Orthodox church, and the Ukrainian co-operative movement—the three most important Ukrainian institutions that were beyond the Party's control. By linking concern for the Ukrainian language and culture with subversion, the trial established an association between national cultural assertion and treason, which would be used in the next decade to justify mass repressions against both non-Communist and Communist Ukrainian intellectuals. On 11 August 1989 the Supreme Court of the Ukrainian SSR admitted that the charges against the 45 defendants at the SVU trial were groundless, and annulled their sentences.